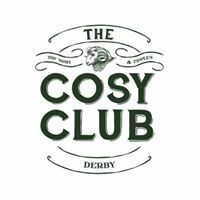 Cosy Club Derby opened to the public in April 2016 after one of the most decadent refurbishments to a building that we’ve ever done. New Winter Menu launched October 2018. New dishes include Scrambled Tofu, Vegan BLT, Game Stew, and our exciting Melting Chocolate Bombe. We also have 10 brand new cocktails available. The gorgeous space dates back to 1837 having formerly been the Royal Hotel, which closed in 1951. Our light, airy building has been restored with large floor to ceiling windows encompassing the whole venue, offering a relaxing drinking and dining experience whether you’re in the bar or restaurant. On entering our Cosy Club at the top of the stairs, we have a wonderful bar area in which to enjoy your favourite tipple. Further along the hallway, our abode opens up to allow you to dine underneath the beautiful chandeliers hung from the high ceilings in our very grand dining room, with a nod to its former state as a banqueting suite. Our pretty little Juliet balcony plays host, overlooking this striking space which can accommodate 150 guests. At the back of the dining room, we have a private room for your special events. Offering a cosy dining experience, meeting or party space for up to 30 guests, the Wallace Room is free to hire, (with only a minimum spend to consider), and was named after the original designer, Robert Wallace – a London based architect whose first major commission was the Athenaeum in Derby. Located on the junction of Corn Market and Victoria Street in the centre of Derby, we have a prime spot that you simply can’t miss. We hope that shoppers, visitors, locals and students of Derby alike can all join us for a ‘Cosy’ experience very soon. Present your CQ card and get 20% off your bill at Cosy Club from 6pm Sunday – 10pm Thursday. Offer not available on bank holiday Sunday or Monday. Offer not available in conjunction with any other offer.